Students enjoy when you provide them with responsibility in the classroom. Not only does it teach them important life skills, it makes them feel like a valuable part of the class. Provided by Colleen of Teaching Heart's, this bulletin board is sure to accomplish all of your classroom management goals, while providing a splash of color to the walls! 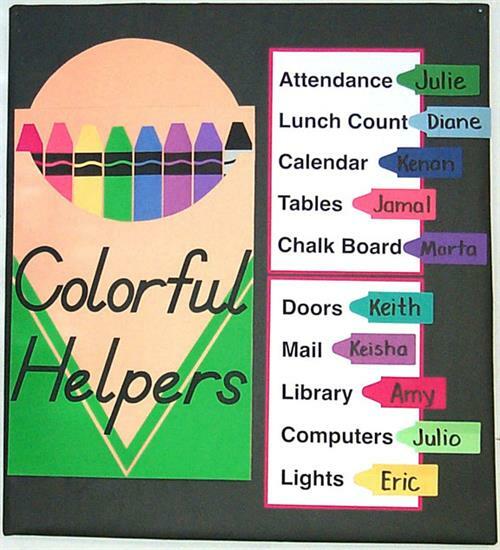 Perfect for any elementary classroom, the most difficult task you'll encounter will be the classroom helper schedule, everything else is pretty straightforward! There are many organizational tools out there to help teachers reach their classroom management goals, we'd be thrilled to hear your ideas on classroom helpers and staying organized! Take a look at our online teacher store, mpmSchoolSupplies.com. It has everything a teacher could possibly need including educational rugs and pretend play toys!